All the parts required for converting your TE 250 to a TE 300. No need for the jets to change the jets on your TE 250. All the parts required for fitting the kick starter to your FE 2013. The combination of kick and electric starter guarantees that you always get your bike running again as quickly as possible. Sealing washer for oil drain plug, also fits the external oil lines. No returns on closeout items. New in their original package. Highly recommended! Protects the intake tract from water and dirt when cleaning the air filter box. Comes with a super-seal base which eliminates the need for grease. Factory Pro Automatic Clutch 81232900000 - This centrifugal clutch opens automatically at very low revs, so it's no longer possible for the engine to stall "unintentionally". No more clutching is required, although it is still possible. 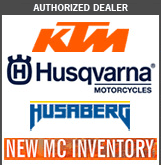 Tested and approved by experienced Husaberg enduro factory riders. Fits TE 250 2011-13 All the parts required for converting your TE 250 to a TE 300 for the E3 class. No need for the jets to be changed on the TE 250 carburetor.